Requires Master's degree with demonstrated research or Bachelor's degree in a field related to institutional effectiveness with demonstrated currency and technical proficiency in the use of databases for research purposes, from a regionally accredited institution. Proficient with basic educational research design, statistics and strategic planning; have direct and recent experience with the Southern Association of Colleges and Schools Commission on Colleges (SACS-COC) requirements for accreditation. Coordinate institutional planning, research and evaluation activities to provide support for comprehensive program of institutional effectiveness consistent with the accreditation requirement of SACS-COC; provide institutional data and reports as required by NC Community College System and various needs of the College. Reporting directly to the President, the position serves as part of the College's leadership team. Salary: $74,004-$84,000 for a 12-month position with benefits. 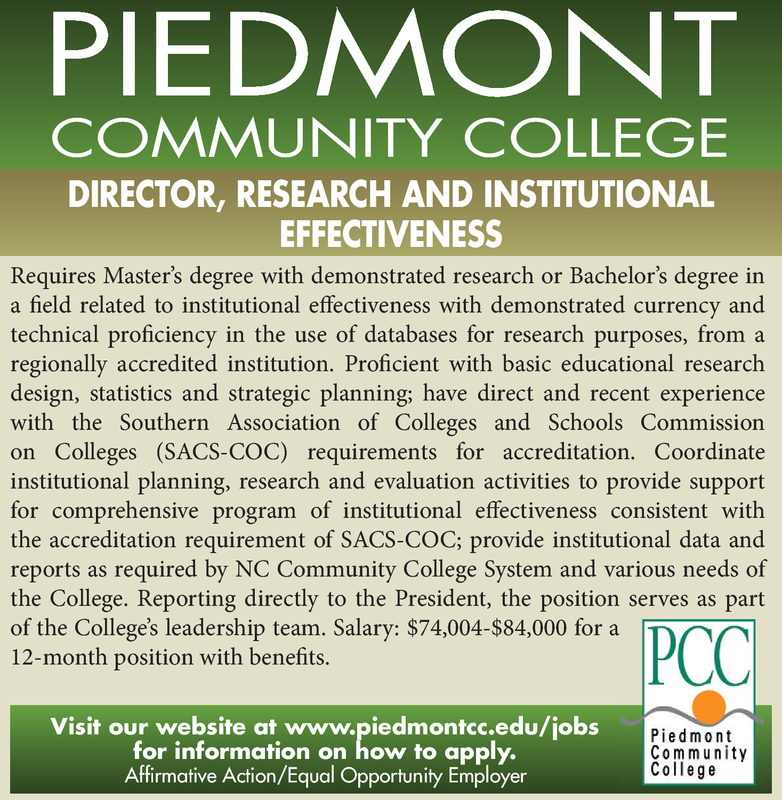 Visit our website at www.piedmontcc.edu/jobs for information on how to apply.